On 28 August 2018, two new acts were gazetted namely Sales Tax Act 2018 and Service Tax Act 2018. 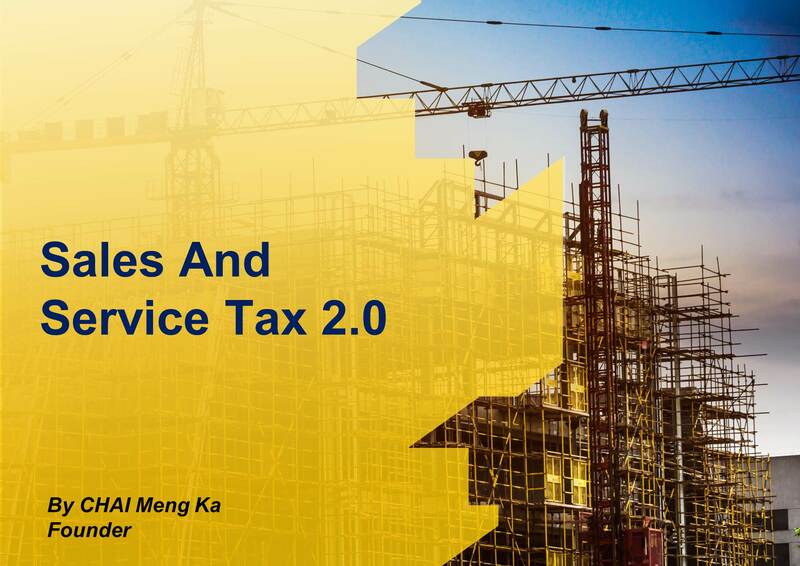 These two acts provide for the implementation of two “NEW” taxes known as “sales tax” and “service tax” or commonly known as “SST” that will replace the goods and services tax (GST) imposed under the Goods and Services Tax Act 2014. To recap the history, sales tax and service tax were first introduced in 1972 and 1975 respectively through Sales Tax Act 1972 and Service Tax Act 1975. After implementing for about 4 decades, these two taxes were replaced by GST on 1 April 2015. This article seeks to provide some basic insights of the SST. In a nutshell, SST is a single-stage tax charged and levied on the taxable goods or prescribed taxable services provided by taxable person. Sales tax is imposed on the taxable goods manufactured in Malaysia or imported into Malaysia. All goods are taxable goods other than those goods listed as exempt goods under Sales Tax (Goods Exempted from Tax) Order 2018. For taxable goods imported into Malaysia, sales tax is charged and collected by Customs upon importation. Whereas for taxable goods manufactured in Malaysia, sales tax is levied and charged by the registered manufacturer when the goods are sold, used or dispose of by him. Manufacturer who is manufacturing taxable goods with sales value of more than RM500,000 in any 12 months period is required to be registered under the Sales Tax Act 2018. However, certain manufacturers such as “personal tailoring service” and “manufacture of jewellery and goldsmiths wares” are exempt from registration under Sales Tax Act 2018. The full list of those manufacturers are listed in the Schedule A of the Sales Tax (Exemption from Registration) Order 2018. Consequently, these manufacturers are exempt from charging sales tax on the taxable goods manufactured by them. Sales tax will not be imposed for goods exported outside Malaysia. Generally, the tax rate for sales tax is 10%. However, certain goods are subject to sales tax of 5% or specific rate. Those goods subject to 5% sales tax or specific rate are listed in the First Schedule or Second Schedule of the Sales Tax (Rate of Tax) Order 2018. “Designated Areas” means Labuan, Langkawi and Tioman. “Special Areas” means any free zone, licensed warehouse and licensed manufacturing warehouse, and Joint Development Area. No sales tax will be levied and charged on taxable goods manufactured in DA or SA other than petroleum manufactured in DA. Likewise, no sales tax will be levied and charged on taxable goods imported into DA or SA. However, the Minister of Finance may declare certain taxable goods be subject to sales tax upon importation into DA or SA. The taxable goods that are subject to sales tax are provided under Sales Tax (Imposition of Sales Tax in Respect of Designated Areas) Order 2018 and Sales Tax (Imposition of Sales Tax in Respect of Special Areas) order 2018. Service tax is charged and levied by the registered service providers. The registered service providers are those prescribed taxable persons who provide prescribed taxable services with sales value of more than prescribed threshold in any 12 months periods. The prescribed taxable services, prescribed taxable person and prescribed threshold are set out in the First Schedule of the Service Tax Regulation 2018. Example of prescribed taxable person are hotel operator, restaurant, lawyer, architect, engineer, accountant & etc. The tax rate for service tax is 6% for all taxable services except for credit card or charge card where the service tax is RM25 per principal card or supplementary card for every 12 months period. No service tax will be levied and charged on taxable services provided in DA or SA by person whose principal place of business is in DA or SA. However, the Minister of Finance may declare certain taxable services be subject to service tax provided under the Service Tax (Imposition of Tax for Taxable Service in Respect of Designated Areas and Special Areas) Order 2018. SST is not a new tax system but just a re-introduction of sales tax and service tax system which have been implemented more than 40 years ago with some modification on the provisions of the act. Sales tax is levied and charged on the taxable goods by manufacturer for goods manufactured by him in Malaysia or taxable goods imported into Malaysia. Therefore, no sales tax will be levied and charged on goods supplied by the wholesaler or retailer. Service tax on the other hand is levied and charged on the taxable services provided by taxable person. As such, not all the services provided are subject to service tax.